French power metal band Nightmare was founded in 1979 and released their debut album "Waiting For The Twilight" in 1984. "Power Of The Universe" was released the next year and then shortly after the band split due to musical differences. In 1999 the band reformed with drummer Jo Amore giving up the drums and becoming the vocalist and frontman The vacant position of drummer was filled by Jo’s brother David. Since then the bands have released five albums, with "The burden of god" being the sixth since reforming (eighth overall). The band have played several major festivals and toured with bands such as Sabaton and Blind Guardian. Brief comments on a couple of the songs.. The album opens with an orchestral number, "Gateways to the void" which is purely instrumental apart from a short spoken piece. The first real song is "Sunrise in hell" which immediately impresses with some great power metal and the vocals are spot on too. "Children of the nation" is on the surface a good solid power metal track with a powerful twin guitar sound, but as you listen more closely you hear the symphonic elements that have been mixed in to the background and which really work well with the song adding an extra dimension to the sound. This is an excellent power metal album, and I'm surprised that Nightmare arent much better known - their music certainly deserves to win them a load of fans. 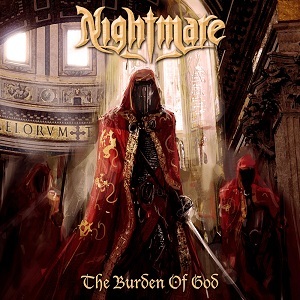 "The burden of god" is out now on AFM records.